Our range of Motorola Baby Monitor Batteries are shipped from here in the UK and made to RoHS and CE standards. Here you will find a range of replacement rechargeable baby monitor batteries and baby monitor battery packs suitable for all types of Motorola Baby Monitors. 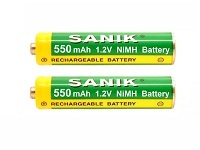 Batteries Plus stocks a range of rechargeable battery packs for battery monitor portable parent units. If your Motorola baby monitor battery is 2.4v or 3.6v and is made of batteries in a battery pack with wires and connector plug, search below by make and model to ensure you order the correct Motorola baby monitor battery pack. You will find batteries for Motorola Digital Baby Monitors listed below also. If you have any doubt or you need help, simply give us a call, and our experts are ready to help.